This fermentation technique is the oldest and still most common method in the preparation of red wine, Usually takes place first stemming to separate the berries from the grape scaffolds. The berries are squeezed so that their juice can escape. In southern countries is still the pounding with bare feet in common, to gently break the berries. This juice-pulp mixture is called mash. The question of pure breeding or spontaneous fermentation plays a far less important role than White wine, as much more vineyard yeasts get into the mash with the skins. This means that even with natural yeasts a good fermentation process (durchgegoren) is possible. Today's trend is going one way dye-rich Wine with harmonic as possible tannins or. tannins to achieve. Regardless of the techniques, the above must be floating marc (Solids) are constantly mixed with the fermenting must or subverted (French pigeage, English punch down) to the extraction to reinforce. This was done earlier in a conventional way by purely manual stirring by means of wooden rods. To a great extent, however, today mechanical methods such as overpumping of the must on the pomace, turning the whole mash in a drum-shaped fermentation tank and punching the pomace by means of Rotofermenter or the Autovinifikation applied. The permanent contact of the mash with the liquid can also be achieved by means of sieves or the like installed in the containers. As a result, the pomace can not rise and is constantly washed around. This is called a "heading-down system". 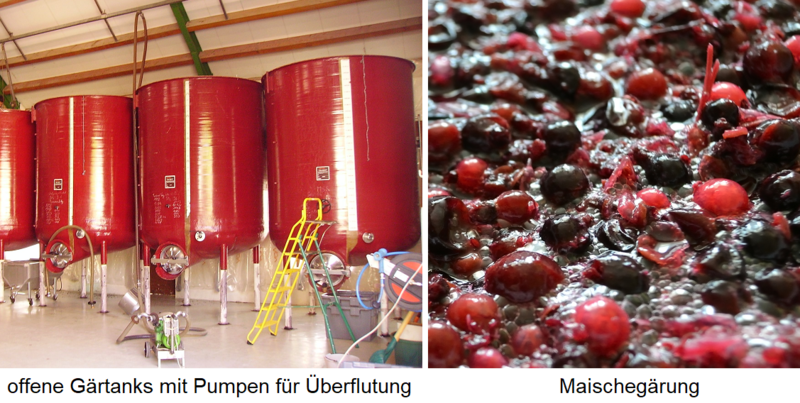 Depending on the desired wine type, the mash fermentation takes place in different fermentation tanks. It is distinguished depending on the fermentation tank in an open and a closed maceration. The traditional open mash fermentation can be carried out in upwardly open fermentation tanks made of wood, concrete or steel. Without mechanical devices, the manual bottoming of the pomace hat, which is necessary two to three times a day, can be very costly. Due to the large surface can alcohol loss to 1.5% vol arise. Also the yeasts multiply faster, but this does not have to be a disadvantage. Another problem is the hygiene, there microorganisms and foreign substances can pass unhindered to the mash. By the increased oxygenation will the formation of film-forming yeasts and Acetobacter Promoted (acetic acid bacteria). These possible disadvantages can be largely avoided with a closed mash fermentation. The capacity is about 75% of the maximum capacity of the fermentation tank. The relatively large one headspace is needed for the rising pomace cap or effective mixing of the mash. Since the access of oxygen can be significantly reduced, a longer maceration time and thus a better extraction is possible. Another advantage is that these closed fermentation tanks can also be used as storage tanks. The corresponding fermentation tanks with the technical possibilities described above are, of course, more cost-intensive and economical only above a certain operating size. The fermentation time results from the desired type of wine and is between a few days (such as the Beaujolais Nouveau and similar wines) and most commonly two weeks (more substantial red wines), but lasts up to four weeks (extract rich reds) and in rare cases even two months (extremely long-lived reds). Depending on the fermentation time and fermentation temperature, the anthocyanins (Dyes) and tannins (Gerbstoffe) more or less intensively extracted from the berry shells, cores and combs. Lower fermentation temperatures or shorter fermentation times result fruitier and species more typical, higher fermentation temperatures or longer fermentation times result in more colorful, tannin-enhanced and more complex Red wines. One in France especially in Burgundy and Bordeaux common method is Saignée (bleeding), in which after a short life Most for the extraction of Rose is deducted and as a side effect the remaining mash or must concentrated becomes. After fermentation is often a further life for further extraction. Does the wine have enough? structure, it is deducted from the mash (forerunner); is still containing sugar, is further fermented. Now this is done Press the mash to separate the remaining wine (caster). In weaker grape varieties such as Blaufränkisch. Pinot Noir. Gamay or Trollinger the non-controversial technique of mash heating (short-term heating) is used to extract more dyes. A special form is the Macération carbonique (Carbonated maceration) Beaujolais Nouveau is common. Other winemaking procedures are, for example Cryomaceration (Red wine) and Maceration (White wine). An old method in the White wine was the addition of up to 20% mashed, destemmed grapes for fermentation. This leads to bodied wines and reduced acidity, but can also emphasize the tannins. Occasionally this is again today such. For example Orange Wine applied. This page was last modified at 13 January 2019 at 09:48.